The Services are offered and available to users who are 18 years of age or older. If you are not at least 18, you must not access or use the Services. We reserve the right to withdraw or amend the Services, and any service or material we provide on the Services, in our sole discretion and at any time without prior notice to you. We will not be liable if for any reason all or any part of the Services is unavailable at any time or for any period. From time to time, we may restrict access to some parts of the Services. To access the Services or some of the resources they offer, you may be asked to provide certain registration details or other information. It is a condition of your use of the Services that all the information you provide through the Services is correct, current and complete. You agree that all information you provide to register with the Services or otherwise, including but not limited to through the use of any interactive features on the Services, is governed by our Privacy Statement. (b) Certain Services may permit you to transmit or upload data, text, designs, graphics images and other information and content (collectively, “User Content”). You retain ownership of any User Content posted or transmitted to or through the Services, but you must grant certain rights to the Port of Portland to use the User Content. Accordingly, you hereby grant to the Port of Portland and its designees a royalty free, perpetual, worldwide, fully paid, nonexclusive, freely transferrable and freely sublicensable license and authority to: (i) use, edit, modify, prepare derivative works of, publicly perform, publicly display, post, transmit, download, transcode, playback, copy, reproduce, distribute, incorporate and otherwise fully exploit the User Content and all intellectual property rights associated therewith in connection with: (i) the Port of Portland’s maintenance, operation, and performance of the Services; and (iii) the Port of Portland’s promotion, marketing and redistribution of the Services and other Port of Portland services and offerings, or parts thereof, in any and all media formats and through any and all media channels. You represent and warrant to the Port of Portland that: (i) you own the User Content which you post or transmit on or through the Services, or otherwise have the legal right to post or transmit such User Content on or through the Services; and (ii) the User Content or the posting thereof to or through the Services does not violate the privacy rights, publicity rights, intellectual property rights, or any other proprietary rights of any third party. The Port of Portland reserves the right to remove any User Content from the Services, as it deems fit in its sole discretion. The Port of Portland name and all related names, logos, product and service names, designs and slogans used in connection with the Services are trademarks of the Port of Portland or its licensors. You must not use such marks without the prior written permission of the Port of Portland. All other names, logos, product and service names, designs and slogans on the Services are the trademarks of their respective owners. In any way that violates any applicable federal, state, local or international law or regulation (including, without limitation, any laws regarding the export of data or software to and from the United States or other countries) (collectively “Laws”). To transmit, or procure the sending of, any advertising or promotional material without our prior written consent, including any “spam” or any other similar solicitation. Modify, decompile, disassemble, reverse engineer, tamper with or otherwise attempt to derive the source code of any software that the Port of Portland provides to you or any other part of the Services. To impersonate or attempt to impersonate the Port of Portland, a Port of Portland employee, another user or any other person or entity (including, without limitation, by using e-mail addresses or screen names associated with any of the foregoing). To engage in any other conduct that restricts or inhibits anyone’s use or enjoyment of the Services, or which, as determined by us, may harm the Port of Portland or users of the Services or expose them to liability. Use the Services in any manner that could disable, overburden, damage, or impair the Port of Portland’s websites or systems, or interfere with any other party’s use of the Services, including their ability to engage in real time activities through the Services. Attempt to interfere with the proper working of the Services. Take appropriate legal action, including without limitation referral to law enforcement, for any illegal or unauthorized use of the Services. The Services may include content provided by third parties. All statements and/or opinions expressed in these materials, and all articles and responses to questions and other content, other than the content provided by the Port of Portland, are solely the opinions and the responsibility of the person or entity providing those materials. These materials do not necessarily reflect the opinion of the Port of Portland. We are not responsible, or liable to you or any third party, for the content or accuracy of any materials provided by any third parties. We may update the content on the Services from time to time, but its content is not necessarily complete or up-to-date. Any of the material on the Services may be out of date at any given time, and we are under no obligation to update such material. All information we collect on the Services is subject to our Privacy Statement. By using the Services, you consent to all actions taken by us with respect to your information in compliance with the Privacy Statement. If the Services contain links to other sites and resources provided by third parties, these links are provided for your convenience only. We have no control over the contents of those sites or resources, and accept no responsibility for them or for any loss or damage that may arise from your use of them. If you decide to access any of the third party websites linked to the Services, you do so entirely at your own risk and subject to these terms and conditions of use for such websites. For clarity, the website http://iflynonstop.com/ is not owned, operated by, or otherwise affiliated with the Port of Portland. The Port of Portland is not responsible for any information posted on such website and is not liable for damages that may arise from its use. The Portland of Portland is based in the State of Oregon in the United States. We provide the Services for use only by persons located in the United States. We make no claims that the Services or any of its content is accessible or appropriate outside of the United States. Access to the Services may not be legal by certain persons or in certain countries. If you access the Services from outside the United States, you do so on your own initiative and are responsible for compliance with local laws. THE SERVICES ARE PROVIDED ON AN “AS IS” BASIS. THE PORT OF PORTLAND MAKES NO REPRESENTATIONS OR WARRANTIES WHATSOEVER, EXPRESS OR IMPLIED, INCLUDING BUT NOT LIMITED TO REPRESENTATIONS OR WARRANTIES REGARDING THE COMPLETENESS, QUALITY, ACCURACY OR NATURE OF THE CONTENT OF THE SERVICES, SECURITY OF USER CONTENT, MERCHANTABILITY OR FITNESS FOR A PARTICULAR PURPOSE. THE PORT OF PORTLAND SHALL NOT BE RESPONSIBLE FOR ANY ERRORS OR OMISSIONS REGARDING CONTENT DELIVERED THROUGH THE SERVICES OR ANY DELAYS IN OR INTERRUPTIONS OF SUCH DELIVERY. YOU UNDERSTAND THAT WE CANNOT AND DO NOT GUARANTEE OR WARRANT THAT FILES AVAILABLE FOR DOWNLOADING FROM THE INTERNET OR THE SERVICES WILL BE FREE OF VIRUSES OR OTHER DESTRUCTIVE CODE. WE WILL NOT BE LIABLE FOR ANY LOSS OR DAMAGE CAUSED BY VIRUSES OR OTHER TECHNOLOGICALLY HARMFUL MATERIAL THAT MAY INFECT YOUR COMPUTER EQUIPMENT, COMPUTER PROGRAMS, DATA OR OTHER PROPRIETARY MATERIAL DUE TO YOUR USE OF THE SERVICES OR ANY SERVICES OR ITEMS OBTAINED THROUGH THE SERVICES OR TO YOUR DOWNLOADING OF ANY MATERIAL POSTED ON THE SERVICES. Anyone who believes that their work has been reproduced in the Services in any way constituting copyright infringement may provide a notice to the designated Copyright Agent for the Services containing the following: (i) an electronic or physical signature of a person authorized to act on behalf of the owner of the copyright interest; (ii) identification of the copyrighted work claimed to have been infringed; (iii) identification of the material that is claimed to be infringing and information reasonably sufficient to permit us to locate the material; (iv) the address, telephone number, and, if available, an email address at which the complaining party may be contacted; (v) a representation that the complaining party has a good faith belief that use of the material in the manner complained of is not authorized by the copyright owner, its agent, or the law; and (vi) a representation that the information in the notice is accurate, and under penalty of perjury, that the complaining party is authorized to act on behalf of the owner of an exclusive right that is allegedly infringed. Please use the same procedure for any claimed infringement of any trademark rights or infringements or misappropriations of other intellectual property or third party rights. Port of Portland employees or their agents (professional photographers and videographers, etc.) 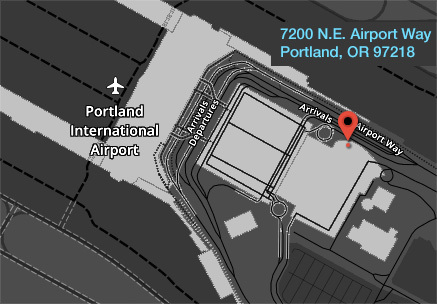 may photograph and/or take video of events and people participating in them in public areas, which includes (without limitation) the Portland International Airport, Hillsboro Airport, Troutdale Airport and other Port of Portland-owned properties. Port of Portland employees or their agents will obtain the written permission of those who will be identified specifically in photos and videos used in Port of Portland projects, mediums and publications other than social media. Social media mediums include but are not limited to Facebook, Twitter, Instagram, YouTube, LinkedIn, Snapchat, blogs, etc. The Port of Portland does not endorse or sponsor any advertising posted by the social media platform host. Port of Portland employees or their agents will obtain oral permission to post images to the Port of Portland’s social media accounts from individuals that they photograph or take video of when their likeness is identifiable in the images. As a courtesy, the Port of Portland will remove a photo or video from a Port of Portland social media post within 24-48 hours from the Corporate Communications Department’s receipt of a removal request (see “Social Media Contact” below). A group of people who will not be named in the photo caption may be photographed or video recorded without permission as long as their likeness is not identifiable in the images. Organizations/individuals intending to take photographs or video on Port of Portland properties for commercial purposes must contact the Port’s Media Relations Department to obtain a filming permit. The Port of Portland recognizes the value of social media in connecting with key constituents locally and around the world. The Port of Portland finds social media channels such as Facebook, Twitter, Instagram, YouTube and others to be a valuable tool for furthering the Port of Portland's goals of outreach, marketing, public dialogue, open government, sustainability, etc. The Port of Portland also reserves the right to terminate involvement on Port of Portland social media platforms by users who post User Content that violates the criteria above. If you have any questions, comments or for more information about these terms, please contact Port of Portland Social Media Manager Christian Aniciete at christian.aniciete@portofportland.com. More information including intellectual property rights, trademarks, copyright infringement and other general terms can also be found here. The Social Media Manager’s hours of operation are regular weekday business hours. The Port of Portland may not respond to comments posted after hours and on weekends and holidays. If you have any questions about this Statement or our use of the information we collect from you in connection with the Services, please contact us.